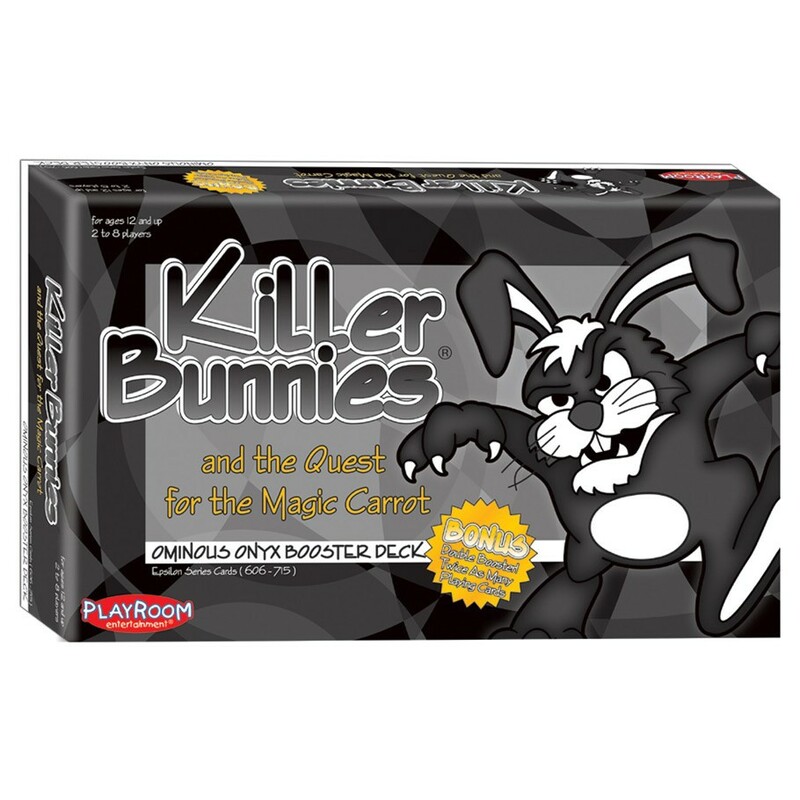 Celebrity Bunnies are new in the KB Quest Ominous Onyx Booster Deck, delighting fans as their favorite celebrities are depicted dressed up in bunny costumes.Also, the supremacy of the Super Bunnies is now overshadowed by the near limitless powers of the Extra Super Bunnies! Another new feature in this deck is the Mysterious Places, which finally reveals the "mystery" of its influence on cards from throughout the Quest series.Additionally, each of the 12 Mysterious Place cards is not only significant at the end of the game but is also linked to a very coveted item -- the infamous Yellow Ball with the Red Stripe (granting complete control over the destiny of cards with its symbol). Hysterical new cards are included, like My Big Fat Bunny Wedding, Strawberry Fields, Adventure in Bunnysitting and Pawn Star.Outrageous new Weapon mechanics, Extremely Terrible Misfortunes and new Special and Very Special cards round out this double booster deck at a full 110 cards!